Wood hangers may be a small part of your business, but they are everything to us. At Hangers.com, customer service and hangers are really important to us. We do not sell hangers as an afterthought or as a secondary product - they are our primary business. We focus on all types of garment hangers and have done so since being founded as International Innovations, Inc in 1990. Since then, we have had continued focus on the customer from both a service and product standpoint. With over 300 styles, Hangers.com offers the largest selection of wood, metal, plastic, fabric, cedar, and eco-friendly bamboo garment hangers. 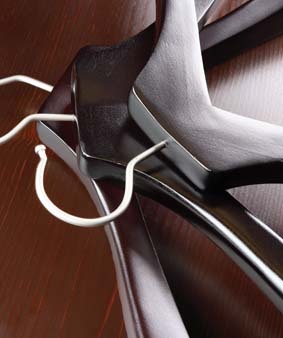 Hangers.com is a leading provider of retailers, distributors, closet companies, hotels, fashion houses, and residences. Hangers.com has a tradition of putting our customers’ needs first – every time. We built our business around your needs – to make your job easier. When you order from Hangers.com, rest assured you will always receive products made at the highest standards using the best materials. Your business – and your image – are important to us. Let us help you make a great impression! Hangers.com has millions of hangers in stock to help satisfy your urgent needs. In stock orders placed before noon CT during standard business day’s ship out that day, all other in stock orders ship the next business day to help ensure your hanger needs are covered. We know hangers and our team of experts are waiting and willing to help you choose options that fit your budget while keeping your image in mind. As one of the largest hanger suppliers in the United States, Hangers.com is able to offer great savings with our competitive, factory-direct pricing. Want your hangers to stand out? Add your logo or a special color. Whatever the need, we can make it happen – and make it perfect. With our corporate and lead sales office in the Live Music Capital of the World – Austin Texas, and a state of the art distribution center near Nashville, our team of qualified professionals are dedicated to handling your order with care. We welcome all inquiries and look forward to assisting you.